Getting to know the different features of your Point of Sale, will help you optimize the efficiency and flow of your business. This guide will give you an explanation of the major features of the POS. Cancel Order: If a customer changes their mind, cancel order gives you the ability to cancel or remove the entire order. Hold Order: In a scenario where your customer needs to step away from the cash register before paying for the order, you can use the Hold Order button. This gives you the ability to place a customer’s order on hold to ring up the next guest. 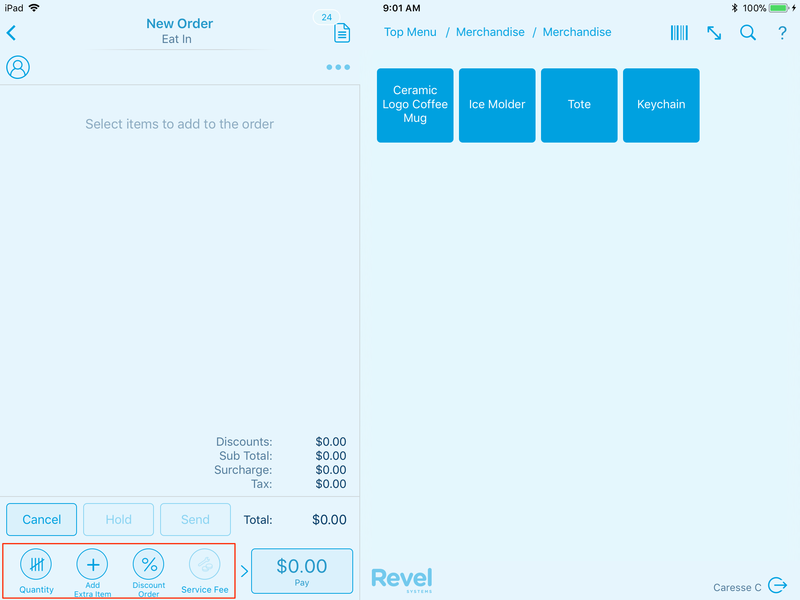 When the customer returns, you can find their order by tapping the orders icon and finding your open order. Customer Icon: If you would like to add a call name or customer to the order, you can tap the customer icon to enter the customer name. Pay: Tapping this icon will direct you to the payments screen. Manage orders If selected, you can close all open orders on your POS. Based on your permissions, you will need a manager or owner PIN. Advanced Search Search for a previous order by the Order ID, Credit Card Number, or Date Range. Sort Preference Use this feature to arrange your orders by customer name, open date, employee name, order id, order total, or order type. Open Orders Displays all orders that were placed on a hold, or not properly closed out from the order screen. Use the Orders icon to an order by Customer name, Order ID, Credit Card, or Date Range. Tap the Orders icon located at the top of the page. To view the full range of search options, scroll to the top of the orders window. 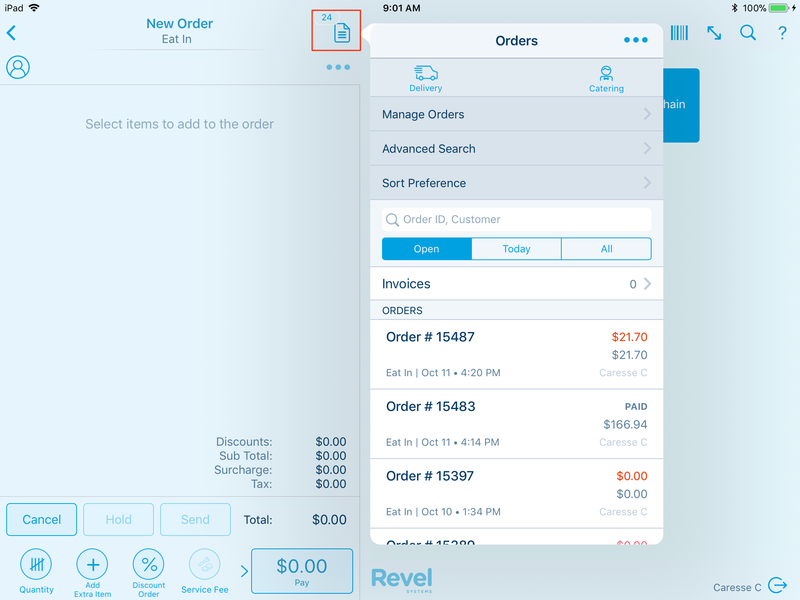 Manage Orders: Managers can use their PIN to close multiple orders at once. Advance Search: If you cannot find an order by order number or customer name, tap Advance Search to find an order by credit card or date range. Sort Preference: Arrange a default organization for the orders window. The action icons are listed on the bottom of your Order screen. These action icons give you the ability to adjust an entire order, rather than one individual item at a time. Add Extra Items This icon will allow you to create a one-time-use item. If you would like to save the item to your inventory, you can select Save to Server. Link Card to Order This feature is mainly used for preauthorization. This feature allows bartenders/waiters/ employees to easily pull up a customer's tab or table by swiping the customer's credit card, as opposed to selecting the tab/table on the screen.,Additionally, it is also possible to link a customer's card to a bar tab with a Preauthorization required. Quantity Using this button will allow you to enter the quantity of the item you want to purchase. Discount Order Using this icon, select an existing discount or create a manual discount towards the entire purchase. Service Fee Add a percentage charge or flat fee to be applied to the entire order. Dining Option Use this button to record your customers order preference. Move Table This will allow you to transfer an order without loosing items. If you would like to move items from one table to a different table, you can select this button and choose which table you want the items moved. Transfer Order Allows you to transfer an order from a one waiter to another waiter. Auto Gratuity This will allow you to enter a present gratuity off this specific order. Add/Remove Tax Use this feature to remove the tax from the entire order.